Hello, BRI fans! It's Andrea back with you (Long time no see, right?) 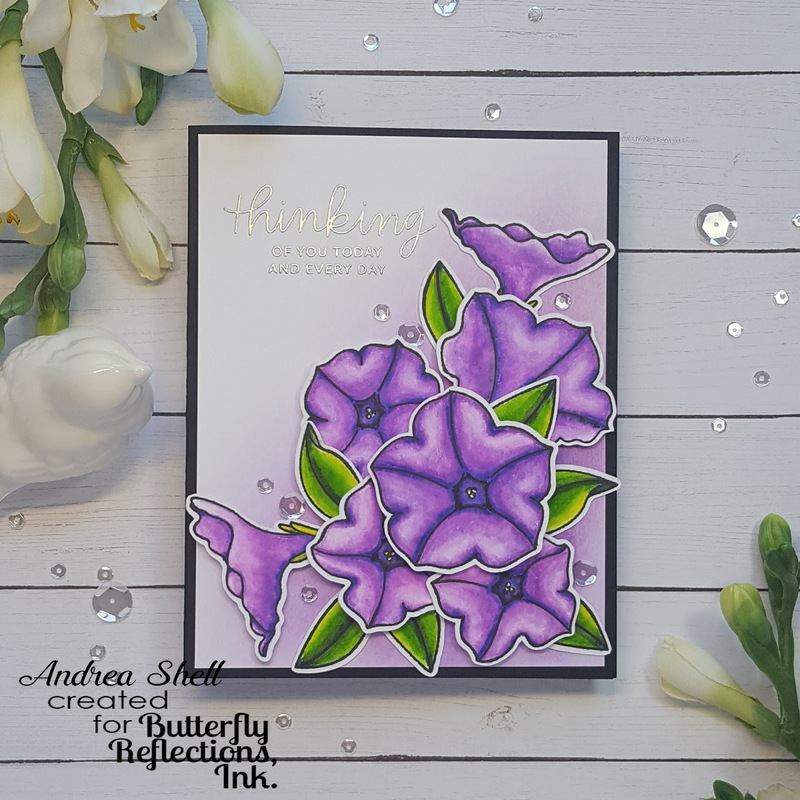 sharing some watercolored petunias. The Pretty Petunias stamp from Pretty Pink Posh has been out for awhile, but it's just so perfect for this time of year, that I couldn't resist pulling it out for today's post. Honestly, I have had this set since it was released, but only just took it out of its package. (I'm sure none of you buys stamps because you just "have to have" them and then don't use them for awhile, right?) Anywho, I stamped all of those gorgeous images with Versafine Onyx black ink onto Bristol Smooth paper and watercolored them with my Zigs and a waterbrush. Once they were dry, I cut them out and added some white dots with a gel pen in the flower centers. Since I'm being honest today, the white gel pen scares me sometimes. I can't tell you how many times I've added details with it and totally regretted doing so. There needs to be a class on it, I think - how much detail to add and where and all that. Anybody else feel that way? I inked up a panel of Bristol Smooth paper with Milled Lavender and Wilted Violet distress inks and silver heat-embossed a sentiment from Pretty Pink Posh's Thoughtful Greetings. I layered my colored images onto the panel with liquid adhesive, glue dots and foam tape. After adhering the panel to a black cardbase with Scor Tape, I finished with some clear sequins from Pretty Pink Posh. That's all from me today. Have a great day!